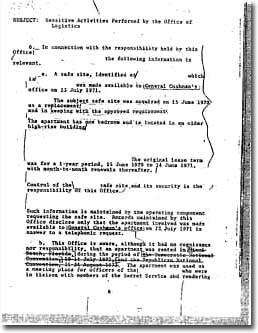 Update – June 26, 2007, 1 p.m. – The full “family jewels” report, released today by the Central Intelligence Agency and detailing 25 years of Agency misdeeds, is now available on the Archive’s Web site. 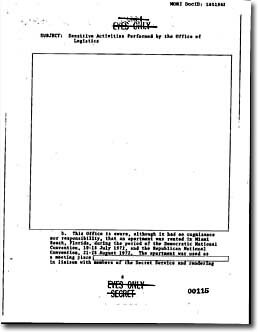 The 702-page collection was delivered by CIA officers to the Archive at approximately 11:30 this morning — 15 years after the Archive filed a Freedom of Information request for the documents. My note: Please check out the mind-control experiments tucked away in these files, as this article notes. Today’s release includes a newly-declassified version of a memo first released 30 years ago in 1977 with substantially fewer excisions (see comparison below). Update – June 26, 2007, 11:00 a.m. – The Central Intelligence Agency has promised to deliver the long-secret “family jewels” report to the Archive within the hour. The complete report, as released by CIA, will be posted here as soon as we can scan it.